Whether you prefer the traditional selection of various sweet and savory delicacies, plant-based or an ethnic, even exotic feast for all senses, this city will provide an option for your liking. The best time to enjoy a brunch in Helsinki is during weekends, when you have time to slow down and patiently take in all the goodness that is a breakfast and lunch combined. 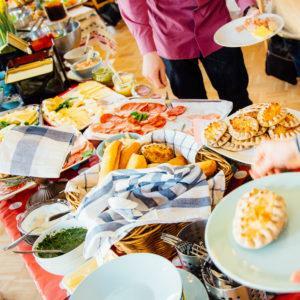 The prices generally vary from 15 to 25 euros, and to ensure a table in this brunch-loving city it should be booked in advance. Here are few of greatest places for brunch in Helsinki! One of the many brunches in the trendy Kallio district! Nearby the lively Hakaniemi market square, at Kuja you’ll get a buffet with grand variety of salads, warm dishes and great choices for special diets. For breakfast treat there’s mouth-watering waffles and variable sides to go with them. Just around the Market Square, this restaurant decorated with Scandinavian minimalism offers healthy breakfast on weekdays and a delicious brunch on weekends. Block is known for having themed brunches, and for instance this weekend it is time for Burger & Shake – American-themed feast. You can reserve a table in advance on their website. Central location and cozy environment have made Kiila one of the favorite spots for casual brunch in the city. Wide range of sweet and savory goods will keep the hunger away for hours, and you can follow the buzzing streets behind the big windows simultaneously. There is a breakfast buffet available on weekdays, and occasionally they have special themed brunches. In case you want to see one of the most wanted brunch spots by locals, reserve a table here. Let all your senses relish the laid-back atmosphere and flavors of North Africa and Middle East. 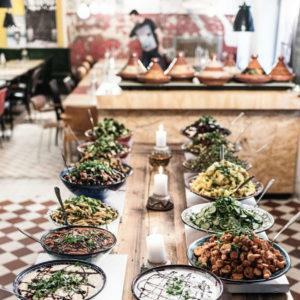 The Saturdays’ Veggie & Vegan Garden -brunch is a veggie lover’s day dream and Marrakech Madness on Sundays will take your mind to magical Morocco. Sandro has three locations – in Kallio, Eira and Kamppi shopping centre’s Kortteli on fifth floor. 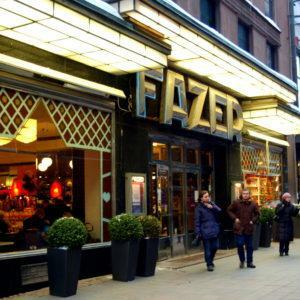 There is multiple Fazer Café’s around Helsinki, but the most popular and central is in Kluuvi. This is one of Helsinki classics, and beautiful décor on every store assures there’s also enjoyment for sight as well as taste. The grand finale of the brunch is a selection of sweet treats made on spot. There is also great, beautifully packaged Finnish chocolate available for purchase so you can bring home sweet souvenirs. Finland’s oldest patisserie-café offers a traditional brunch with great selection of their own bakery’s products and seasonal Finnish delicacies. Located on the idyllic Boulevard hence the scene brings a new dimension to the experience. Great coffee and food prepared according to traditions will delight every visitor. Again, a table can be reserved on the website.